on June 19th at 5:30pm at the GreenLife Inn at the Mimosa. 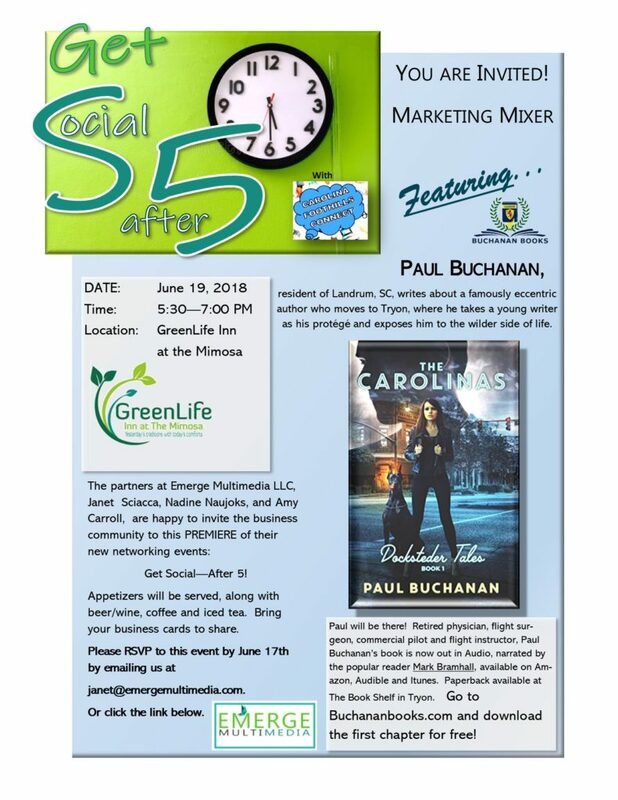 The event is a collaboration for Buchanan Books by Emerge Multimedia partners Janet Sciacca, Nadine Naujoks and Amy Carroll, innkeepers Mary and Kevin Parker of GreenLife Inn, and Carolina Foothills Connect. The event’s main feature will be a meet and greet with local author Paul Buchanan along with Brad Buchanan, editor and publisher. Buchanan’s book, Docksteder Tales Book 1, The Carolinas, takes place in Tryon and Landrum in 1995. Characters and locations are recognizable in the book and whether you are a local or not, it’s an especially intriguing story with drama, love and danger, and continues to Book 2 which will be out this summer. Come and find out more, pick up a copy, and have it signed. The book is also available at The Book Shelf in Tryon, and in audio on Audible, Amazon and iTunes, read by the popular narrator Mark Bramhall. Appetizers and beverages (beer/wine/coffee/tea) will be offered. Bring your business cards for sharing at this marketing mixer that you know will be great! We request that you please RSVP by June 17th by emailing janet@emergemultimedia.com. This new event is part of Emerge Multimedia’s free weekly Get Social morning sessions held throughout Polk County for business owners, managers and others with digital marketing tips and tricks to improve your on-line presence.